St. Patrick’s Day is such a fun holiday! 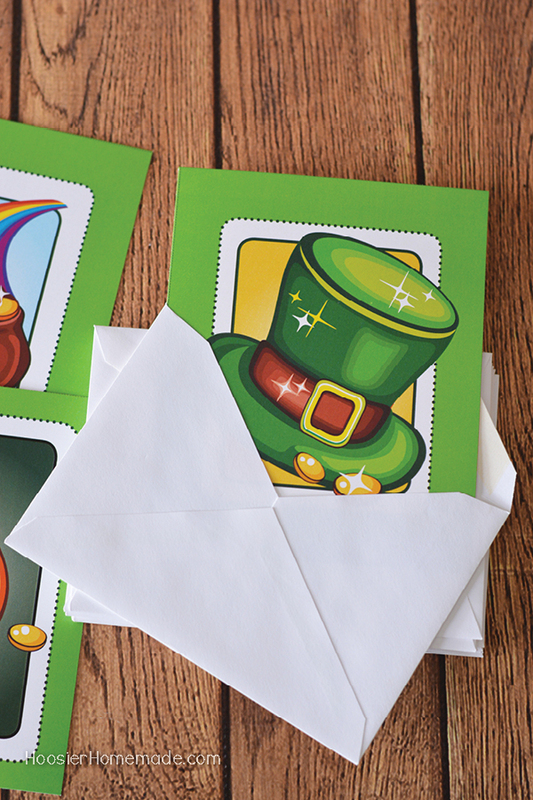 Whether you are Irish or pretend for the day (like us), you can give these free printable St. Patrick’s Day cards to friends, neighbors, or use them as gift tags. St. Patrick’s Day has always been a huge favorite in our home. 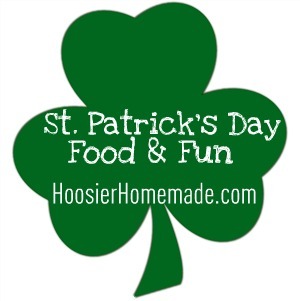 My favorite part, of course, is whipping up fun green St. Patrick’s Day treats. The Leprechaun Cupcakes are probably the cutest I have ever made, but the Frosted Mint Brownies and Mint Oreo Truffles are delicious too! Creating family memories is by far my favorite thing to do. And honestly, the times that we had fun and didn’t spend much money, were the times that we all remember the most. I think one of the reasons I love the small holidays is because there aren’t big expectations placed on myself. For St. Patrick’s Day, serving a fun “green” dinner with dessert is perfect. If you want to do a little more though, I loved when Lucky the Leprechaun came to visit our home and made a huge mess. 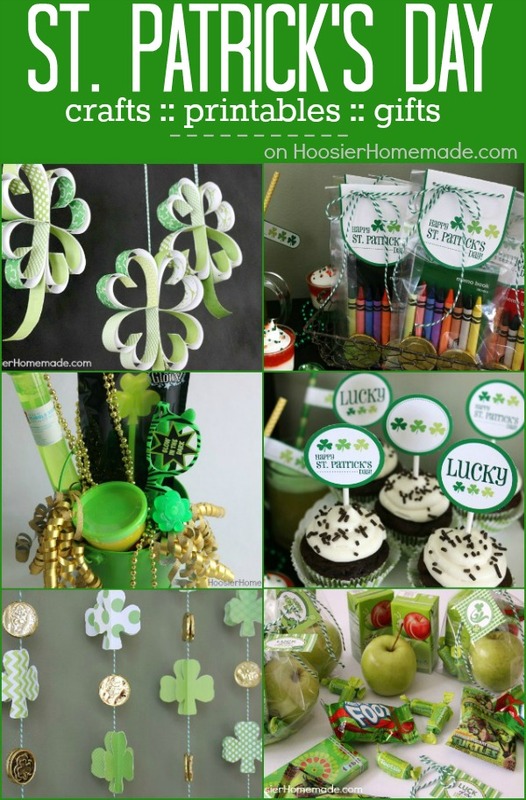 If you are planning on having friends over, or maybe helping with classroom parties, be sure to grab our other St. Patrick’s Day printables. 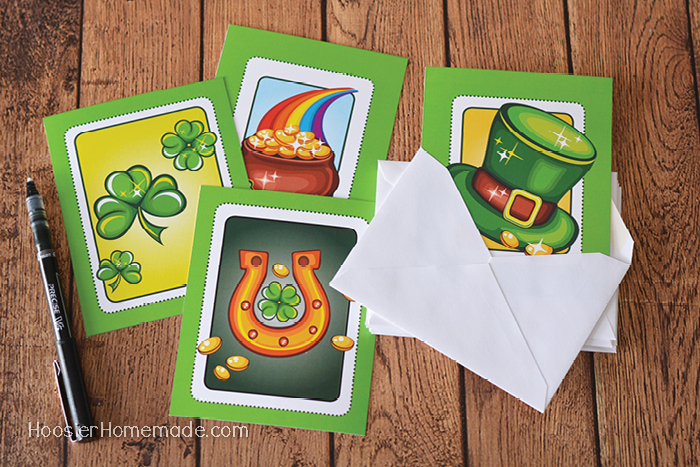 These Printable St. Patrick’s Day Cards are so much fun for kids of all ages. You can print these out and hand them out to everyone you know for St. Patrick’s Day. Sort of the same idea as Valentine’s Day, but with a twist. Tuck in a couple gold chocolate coins for good luck! When you print the cards, they come 4 on a page. Each card measures 4×5 and will fit into an invitation envelope. 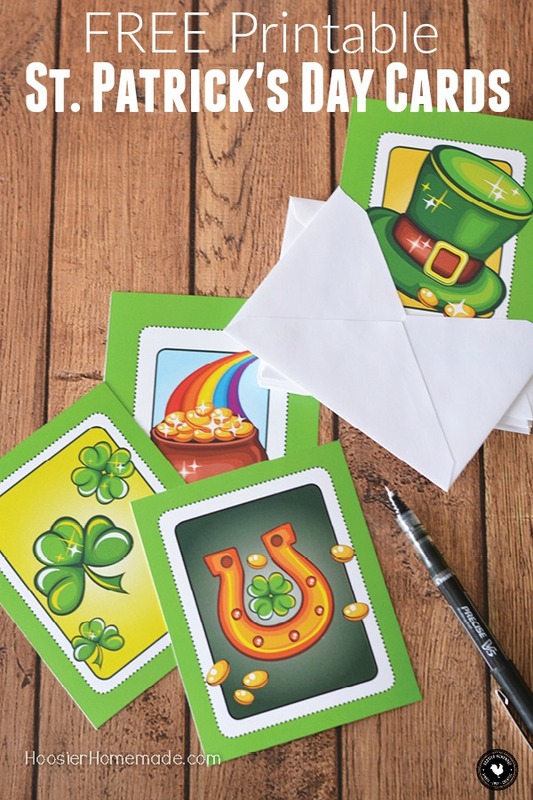 You could even put together little St. Patrick’s Day Treat Buckets and add these cards. I think our son that is in college will love a bucket filled with treats from home.